For publication in the International Journal of Sports Medicine (IJSM), studies involving human participants or animals must have been conducted in accordance with recognised ethical standards and national/international laws. At the very first stage of paper submission, authors are required to adhere to these and all other relevant standards and laws. In the 21st Century, research opportunities, approaches and environments are in a continual state of flux, and this is also the case for the associated ethical issues. In the original 2009 IJSM editorial , we described the ethical considerations embedded into national/international laws and provided specific guidance on the ethical issues which commonly arise in Sports Medicine research. In 2011, this information was updated to recognise the ethical principles of other professional associations and treaties when conducting research involving human participants . Additional information was also provided on the use of Laboratory Animals in research, and on the links between sample size and research ethics. 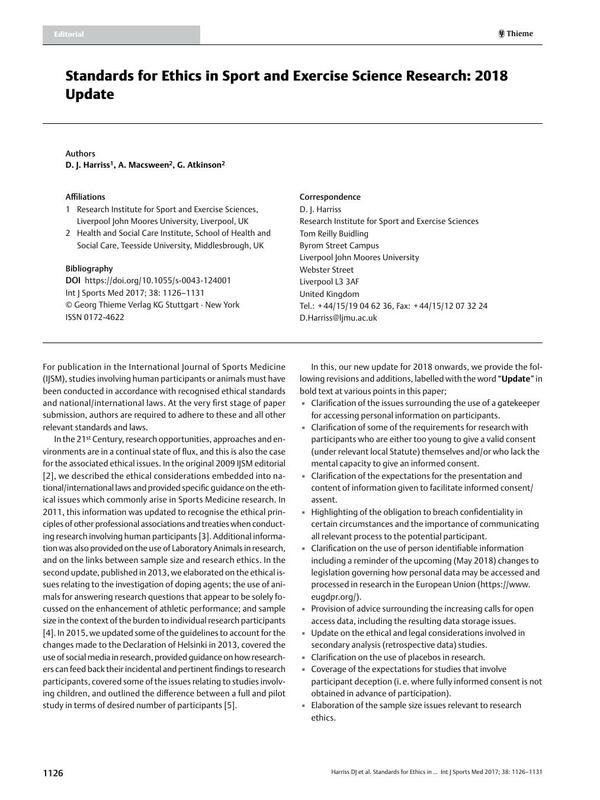 In the second update, published in 2013, we elaborated on the ethical issues relating to the investigation of doping agents; the use of animals for answering research questions that appear to be solely focussed on the enhancement of athletic performance; and sample size in the context of the burden to individual research participants . In 2015, we updated some of the guidelines to account for the changes made to the Declaration of Helsinki in 2013, covered the use of social media in research, provided guidance on how researchers can feed back their incidental and pertinent findings to research participants, covered some of the issues relating to studies involving children, and outlined the difference between a full and pilot study in terms of desired number of participants . Clarification of the issues surrounding the use of a gatekeeper for accessing personal information on participants. Clarification of some of the requirements for research with participants who are either too young to give a valid consent (under relevant local Statute) themselves and/or who lack the mental capacity to give an informed consent. Clarification of the expectations for the presentation and content of information given to facilitate informed consent/assent. Highlighting of the obligation to breach confidentiality in certain circumstances and the importance of communicating all relevant process to the potential participant. Clarification on the use of person identifiable information including a reminder of the upcoming (May 2018) changes to legislation governing how personal data may be accessed and processed in research in the European Union (https://www.eugdpr.org/). Provision of advice surrounding the increasing calls for open access data, including the resulting data storage issues. Update on the ethical and legal considerations involved in secondary analysis (retrospective data) studies. Clarification on the use of placebos in research. Coverage of the expectations for studies that involve participant deception (i. e. where fully informed consent is not obtained in advance of participation). Elaboration of the sample size issues relevant to research ethics. Coverage of the issues surrounding research on contracted athletes, who are obliged to have data collected on them as part of their contract. Clarification of expectations for the reporting of adverse events/reactions.